Whether you are researching your family history in the United States, England or other countries, it is most likely you'll find one or more ancestors who died during an outbreak of disease. You won't always know if they were the victim of the Spanish Flu of 1918 or a local outbreak of yellow fever or cholera; research related to epidemics and pandemics takes skill in unearthing not-so-obvious records and connecting the dots. Record all information related to an ancestor's death or illness, even the tiniest detail. Make sure you include location of not just where the person lived, but where the death took place, the attending physician, etc. Death certificates are good resources for this information. Also incorporate data from letters and diaries of other family members living at the time. How you track your data can be very important when researching epidemics. You need an easy way to sort data (spreadsheet programs like Microsoft Excel or Google Drive's Spreadsheet) in order to track clusters and see patterns. Also consider creating a "mind map" to map out known information and leads to other records. Finally, create your own customized map using Google Maps to pinpoint the extent of an epidemic in specific regions. For most genealogists and family historians, it isn't possible to know all of the historic outbreaks of disease, especially on a local level. Often, yellow fever or cholera where very localized and brief in terms of time span. 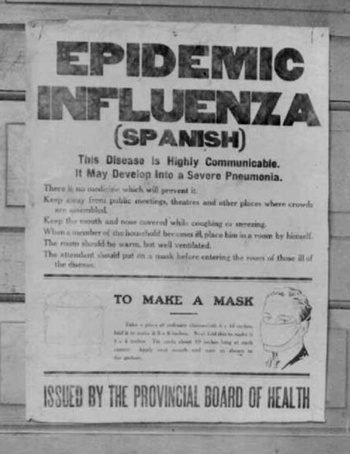 And then there were the major pandemics which spanned the world such as the Influenza of 1918 better known as the "Spanish Flu" here in the United States and "La Grippe" elsewhere. Historical and Genealogy Societies. Look online for exhibits and resources; one example is Epidemic Scourges in Tennessee from the Tennessee State Library and Archives. Also search the catalog of materials and make an in-person visit to access those items not available in digital format. Genealogy Magazines and Websites. From time to time, genealogy society quarterlies or national genealogy magazines will focus on the theme of epidemics, disease and deaths from those diseases. See Major US Epidemics - Family Tree Magazine. Newspapers. An epidemic was not always evident right away and since news didn't always travel as quickly as today, special research strategies are needed for newspapers. Look for standard death information and then search forward over the next few weeks or months to look for news of an epidemic. You may also find front page articles highlighting a public health crisis such as cholera or typhus. A good example of how news traveled is illustrated in Scarlet fever epidemics of the nineteenth century: a case of evolved pathogenic virulence? (opens as PDF). The 1858-59 scarlet fever epidemic in Massachusetts is detailed using various newspaper articles. For certain record sets such as mortality schedules from the U.S. federal census or a state census, look for dates within the same time period and the same disease or cause of death. When using necrologies, like those published in newspapers or in yearbooks, look for "spikes" in the number of deaths. The cause of death is not always published in necrologies. For death record indexes, also look for spikes in deaths across certain time periods. Plot deaths for a town or a neighborhood on a map using Google Maps or a similar program where you can "pin" information. Research in newspapers especially in the death notices and the "local news" column which can read much like a gossip column. Look for the "disappearance" of certain family members in records as well. Often with tuberculosis, a patient was sent to a hospital or sanitarium for long-term recovery. Or other family members may have been sent away to live with other relatives so as not to "catch" a disease or ailment. Death Certificates. Scour death certificates and look for every detail, especially in the physician or medical condition area. Also, did the person die in a hospital with other victims of an epidemic? No detail is too small - record everything! Death Record Indexes. Use these indexes to look for clusters of deaths by location and date. Tip: it may help to copy and paste data into a spreadsheet and then sort the data to visualize the clusters. General Database Search. Access sites such as US Gen Web Archives or RootsWeb Search Thingy. Search for "epidemic" or a specific disease such as "cholera" and also add variants such as location or date. Local Research Guides. Many libraries and archives will organize their resources related to death and disease into research guides. A good example is Epidemics & Diseases - Rutgers University Libraries Research Guides. Medical Society Yearbooks. Locate yearbooks or quarterlies published my state and local medical societies on Google Books and Internet Archive. Often listings of outbreaks and even statistics related to deaths can be found. Example: The Medical and Surgical Reporter, Volume 39 from 1878. Message Boards. The major genealogy website such as Ancestry.com and MyHeritage don't have epidemic specific boards. Search for the disease and the term "epidemic" in the general message boards. Mortality Schedules. For certain years, federal and state census enumerators were asked to note all deaths in the previous year, sometimes including the cause. See Expert Series article "Bring Out Your Dead: A Look at Mortality Schedules" for more information. Municipal Fact Books. Some cities published death and disease statistics on a regular basis. Locate these books online via Google Books and Internet Archive or at libraries, archives and historical societies. See Municipal Facts: Volume 1 Number 2, 1918 April for Denver, Colorado. Necrologies. At the end of each year, many newspapers would print a list of all those who had died in that year (sometimes the necrology was printed in the first week of January). Cause of death was not always listed, so look for clusters of deaths in the data. Newspapers. The best source for small epidemics limited to a city, town or county. Read the local "news column;" note who had taken sick or the cause of the illness. General news articles will also warn the local readers of an outbreak and the precautions to take. Specialized Databases. Some genealogical and historical societies have started to index records related to epidemics. Example: "Jewish Consumptive Relief Society, Denver, Colorado, 1904-1940" at JewishGen. Search Google Books and Internet Archive for published personal accounts, mainly from the 19th century. These accounts describe the impact of outbreaks such as yellow fever and typhus on the community; often names of those who died are also listed. Search using keywords such as "yellow fever" plus the name of the locale. A good example is Condensed History of the Great Yellow Fever Epidemic of 1878 by Peter Murtough highlighting a yellow fever outbreak in Memphis, Tennessee. Access letters and diaries at historical and genealogical societies. Realize that early on in an outbreak, the person may not be aware that others were also sick. News accounts appearing weeks or months later might state the time span and geographical area of the epidemic. Also look for alternate medical terms such as "consumption" for tuberculosis. Interview family members. Some of your older relatives may have heard stories of family members perishing during the 1918 flu pandemic or from tuberculosis. Cyndi's List. Medical & Medicine > Epidemics & Plagues. Library of Congress. Chronicling America. Taylor, Maureen A. "Major US Epidemics."